This summer I picked up one of these flyers at a local business in Long Lake. I was intrigued by it. It sounded too good to be true; food, music, lights, fireworks, bonfires, and a boat parade, all for $25 if you brought your own boat. I thought the best person to get the scoop on this event was my friend Hallie Bond. If it involves boats in the Adirondacks then Hallie will know about it. After all, she is the former curator of watercraft at the Adirondack Museum and has authored the classic volume, Boats and Boating in the Adirondacks. Sure enough, Hallie was on the committee that planned the activities surrounding the flotilla. 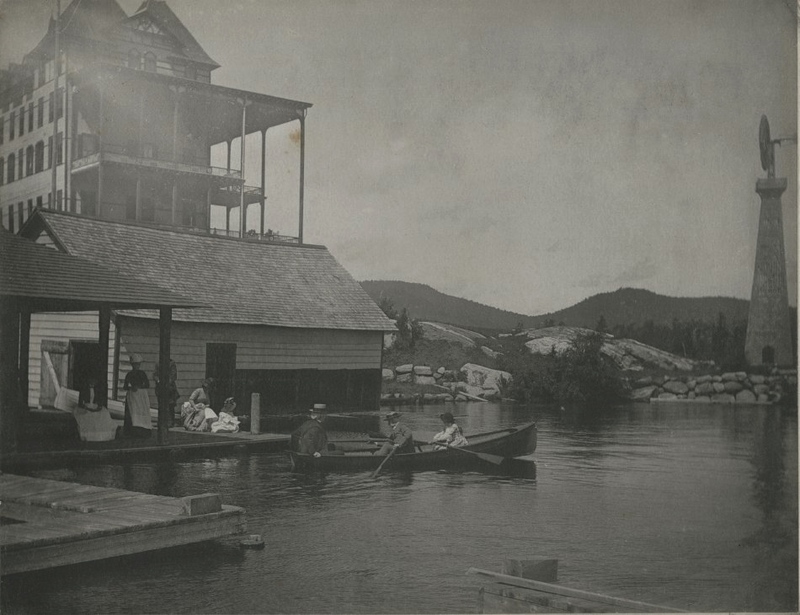 The idea for the flotilla originated with David O. who, with his brother Paul, operate Prospect Point Cottages. Prospect Point Cottages now occupy the site of the former Prospect House hotel, which opened in 1882. Here is a description of the Prospect House taken from the Prospect Point Cottages website. 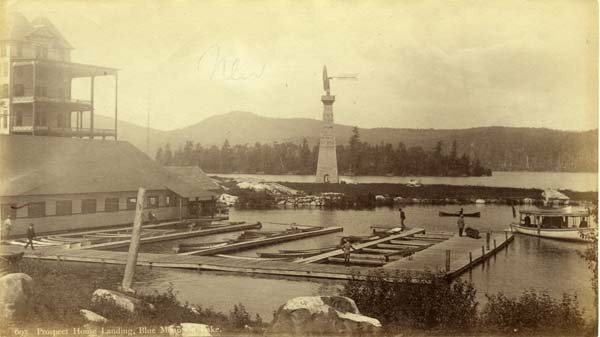 “It is difficult now, gazing at the quiet cabins, trees and fields, to imagine that Prospect Point has a unique place in Americas past. But it was this point with its magnificent setting that Frederic Durant, nephew of railroad tycoon, Thomas C. Durant, chose as the place to to realize a grandiose vision. 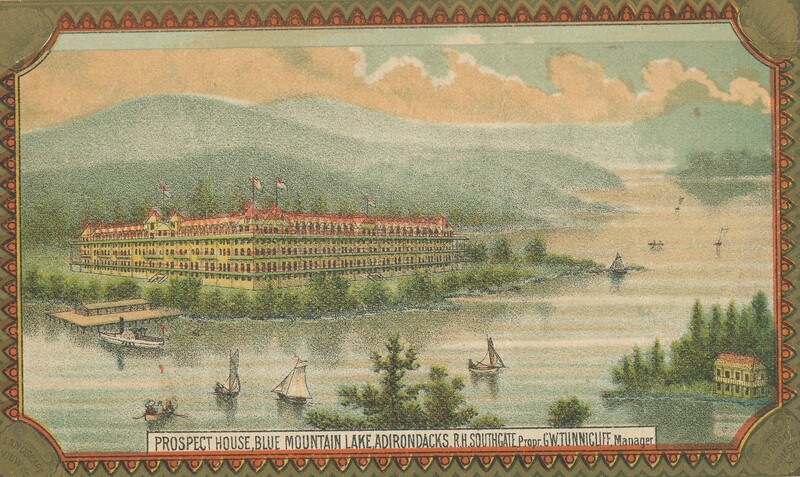 In 1881, on the grounds of of Prospect Point, Durant erected what swiftly became the most fashionable mountain hotel in the Northern United States. With the help of Thomas Edison, who saw to the electricity, Durant’s fabulous Prospect House was the first hotel in the world with an electric light in every room. It soared 6 stories high, boasted 300 rooms, accommodated 500 to nearly 600 guests, and offered a bowling alley, barbershop, shooting gallery, billiard room, hydraulic steam elevator, electric bells, restaurant, library, physician and pharmacy, telegraph office, steam heat and resident orchestra, which twice each day charmed America’s wealthiest and most influential citizens. Among them were the Astors, Tiffanys, Whitneys, Vanderbilts and many others. Here are some photos and drawings of the Prospect House provided by Hallie Bond and the Adirondack Museum. 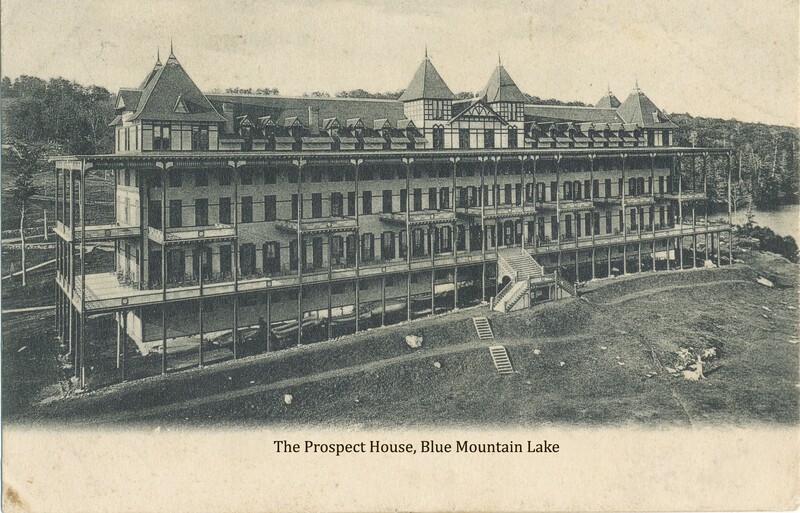 The Prospect House as seen from the east end of Blue Mountain Lake. Rendering of the Prospect House in 1884. Courtesy of the Adirondack Museum. Prospect House as viewed from the windmill used to provide water to the hotel. 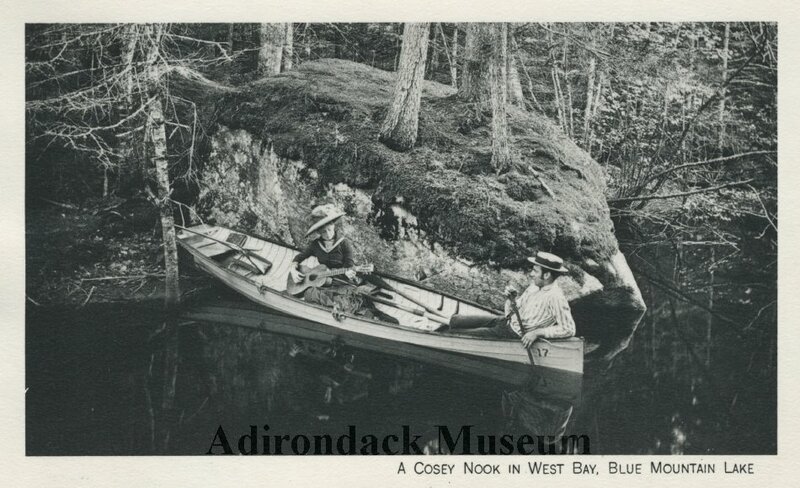 Photo courtesy of the Adirondack Museum. One of the special activities of the Flotilla celebration was a talk given by Hallie on boats and boating at the Prospect House. She shared the photos and commentary in that talk with me. 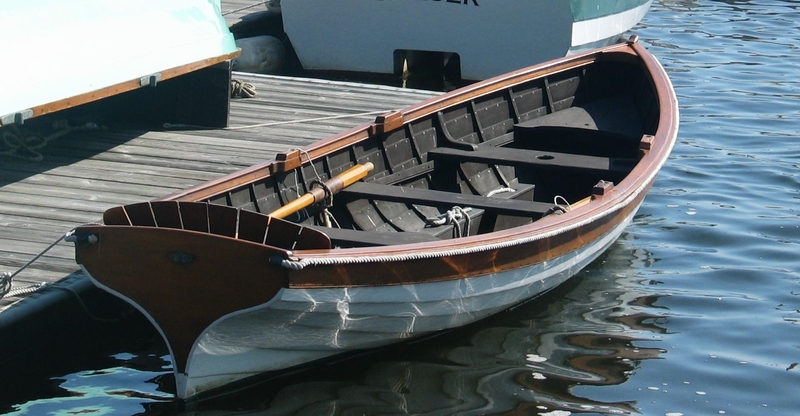 The boats at Prospect House were not guideboats, as one might expect, but a craft similar to one called whitehalls. The whitehalls I know were used as water taxis in the New York and Boston harbors. They were rowed, or sailed, and could be used by ship chandlers to intercept clipper ships as they approached these harbors. The first boat to board an inbound ship would more than likely get the business. Here is a whitehall, Elysea, built by by my Uncle Don with the help of master ship builders on the Eastern shore of Maryland. They used the old tools and methods to build her. Uncle Don donated Elysea to the Mystic Seaport Museum. Note the wineglass stern and lapstrake planking that are the hallmarks of whitehall construction. A seagoing whitehall, Elysea, built by my Uncle Don. None of the over 80 boats used at Prospect House remain. Hallie found a reference to them that said they were “broad boats of the Champlain type”. They were transom-sterned craft of the whitehall shape. They were built by a fellow named Fletcher Joyner, a former Adirondack guide. However we do have some images of them. Here is a rather romantic scene. Photo entitled “Cosey Nook”. Photo courtesy of the Adirondack Museum and Hallie Bond. The boats were launched from finger docks as shown below. Finger docks at the Prospect House. The tower in the distance is the windmill used to supply water to the hotel. Photo courtesy of the Adirondack Museum and Hallie Bond. The guests were allowed to go out in the boats on their own without a guide. This resulted in more than one amusing situation, I am sure. Here is one such instance. 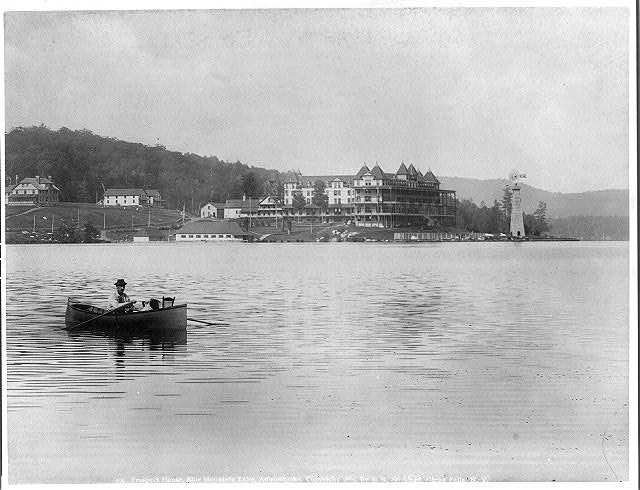 Guests go out for a row. The gentleman in the stern looks like this was not a good idea. Photo courtesy of the Adirondack Museum and Hallie Bond. Hallie was curious as to what you do with 80 some boats in the wintertime. She found a photo showing that they were stashed on the balconies of the Prospect House. Next time we well follow the day’s activities of the Flotilla celebration. In the final post on the Flotilla I describe our rather harrowing experience as we partake in the Flotilla.